Give me a medieval walled town any day of the week. 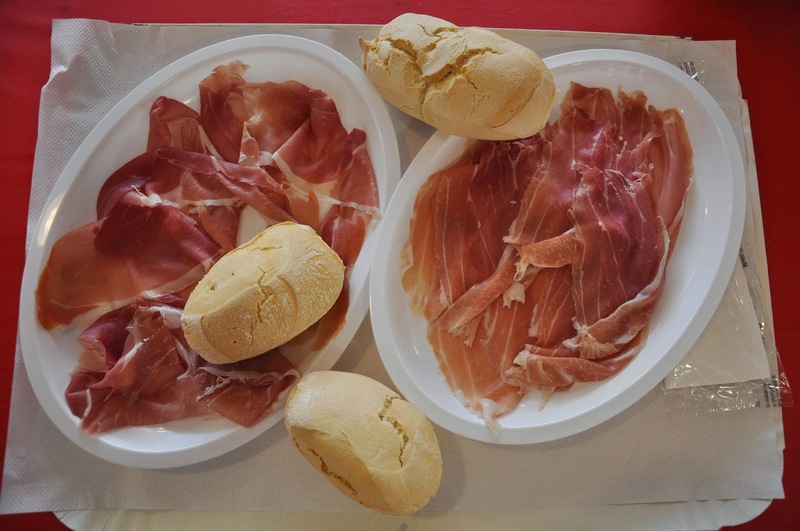 Couple it with a Prosciutto Festival and I will be there faster than you can spell, ahem, ‘p-r-o-s-c-i-u-t-t-o’. I love prosciutto! 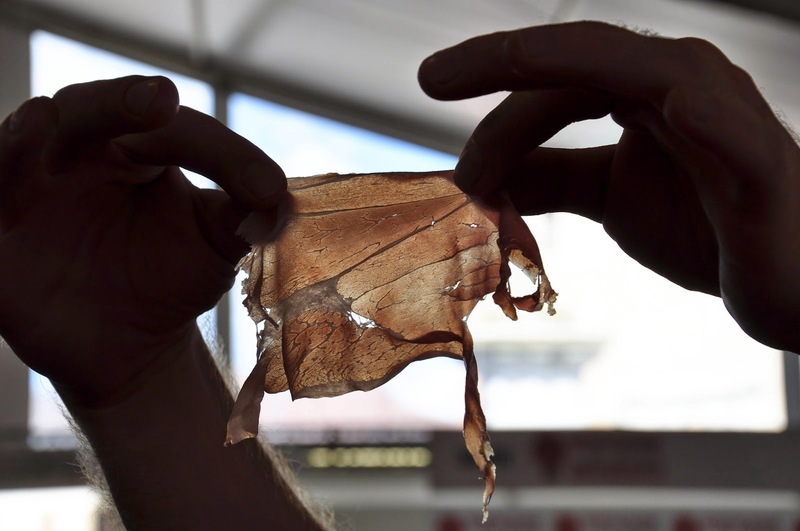 This tender paper-thin slice of dry cured meat which melts on the tongue and is made following a centuries-old process. In Britain buying it always felt like a luxury. Maybe it is just me, but at the same time, the only piece of prosciutto they would seem to have on the counter would look smallish and dryish with a thick layer of fat. 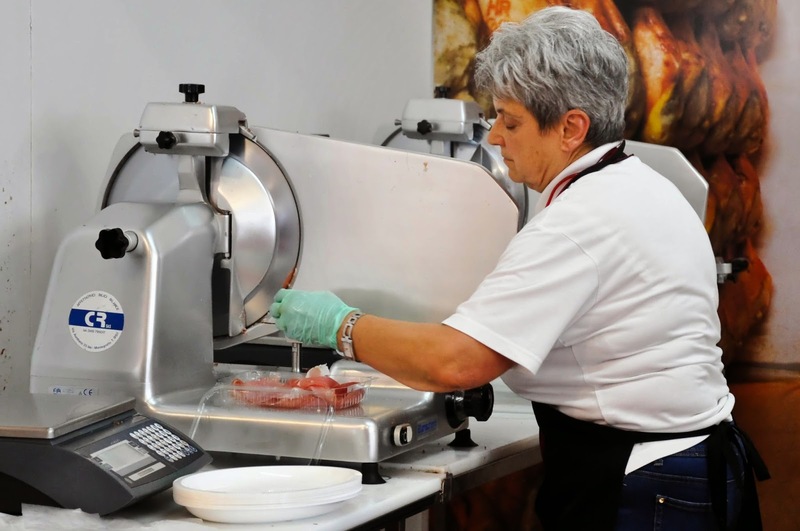 Now that we live in Italy, we use any opportunity to indulge, especially as in any Italian supermarket they know exactly how to slice it – thin and with the excess fat removed leaving just a delicate white strip running along the pink meat. Bliss! 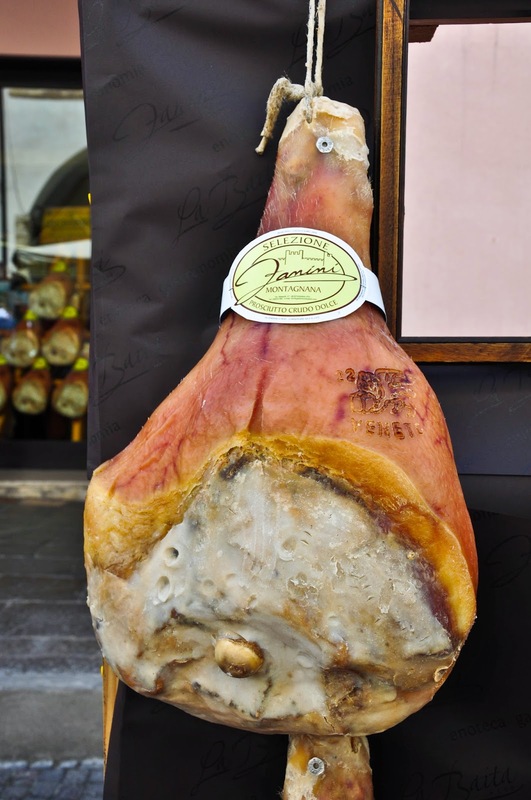 As luck would have it, we also live very close to an area where prosciutto is made and has protected designation of origin (or DOP in Italian). 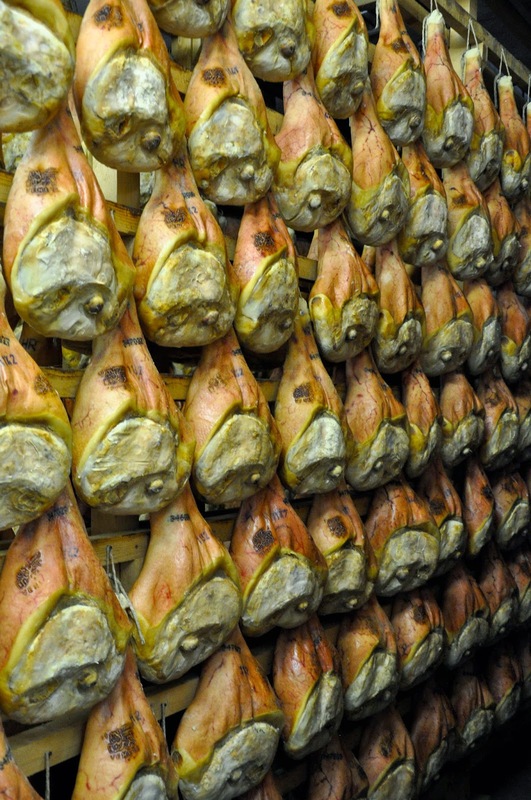 The Prosciutto Veneto Berico-Euganeo DOP is made only in the fifteen municipalities of the provinces of Padua, Vicenza and Verona which form part of the Berici Hills and the Euganean Hills – places of outstanding natural beauty and with the right climate for the proper maturing of the prosciutto. 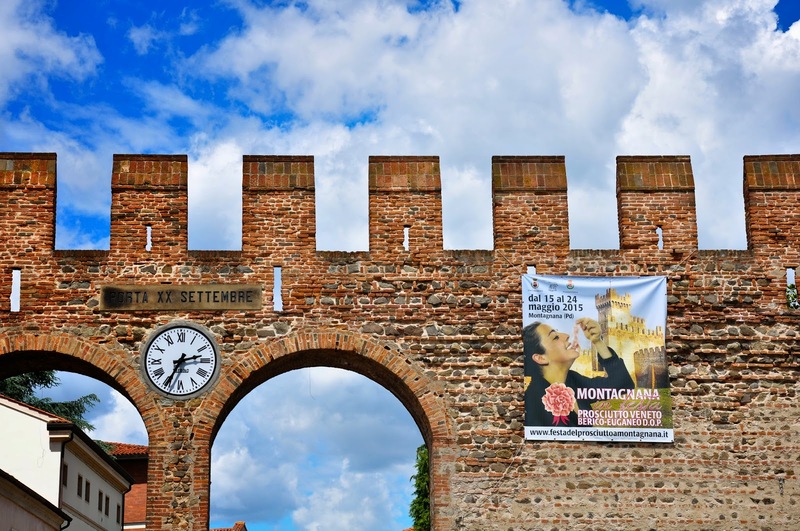 So, when we found out that a two-week long Prosciutto Festival was being held in one of the local centres of prosciutto making – the medieval walled town of Montagnana – we piled in our little red car and headed there as fast as it could drive us this past Sunday. It was a beautiful day. The sky was the tenderest shade of blue interspersed with fluffy white clouds. The fields of Veneto, watered by the rain of the previous day, were stretching ahead of us lush and green. The sun was up, too and by midday its shine turned into a full-blown blaze. 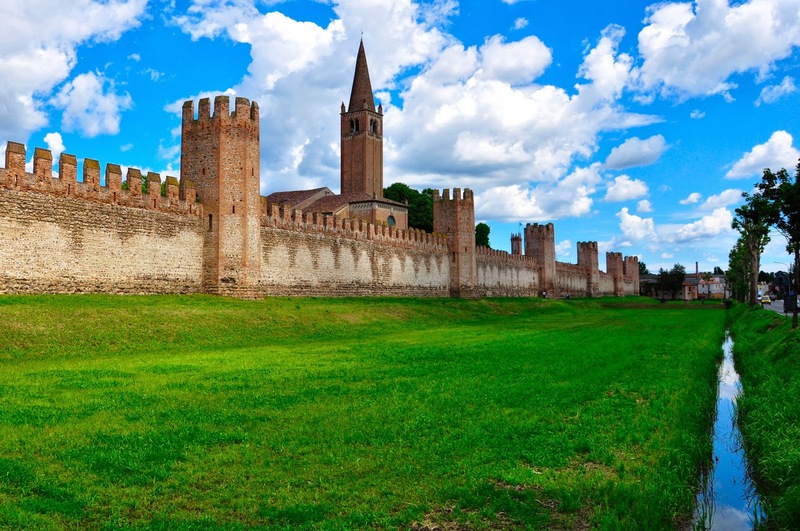 Forty-five minutes later we pulled in Montagnana – its huge defensive wall leaving us speechless for a moment. It was tall and powerful, dotted with turrets and holding in its embrace a lively and picturesque town. 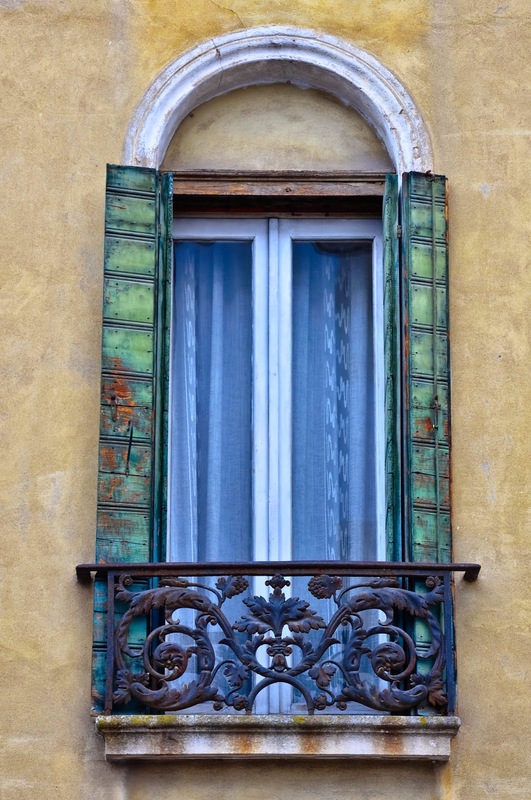 We roamed the streets of Montagnana for a while, admiring its old buildings and its nod to modern life. 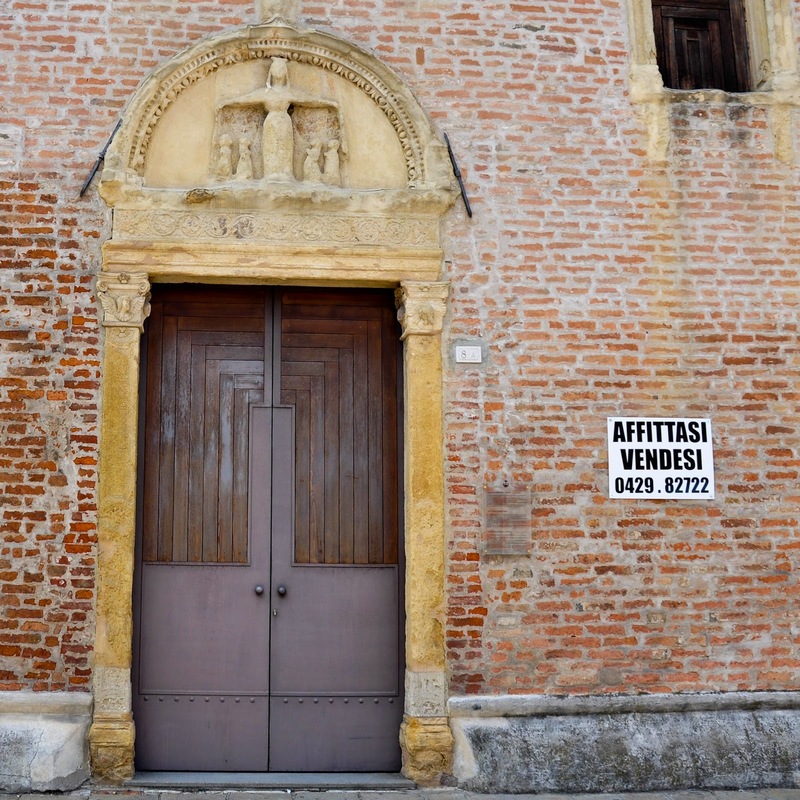 The first thing which caught our eyes was the Old Hospital of the Nativity, which was mentioned in documents as early as the fourteenth century and it still contains traces of frescoes by Buonconsiglio. A large sign ‘For Rent / For Sale’ was attached to its medieval wall in case you are looking for a piece of history to make your own. 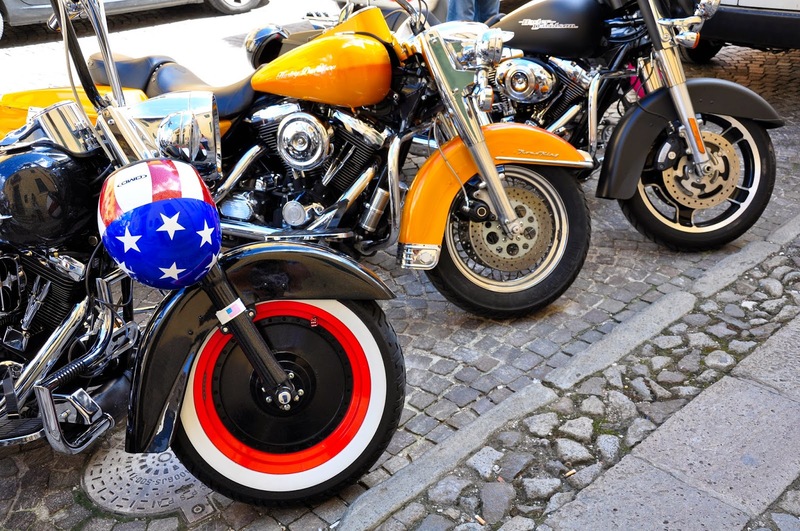 Right opposite the ancient hospital a fabulous gaggle of motorbikes was parked. To our surprise all through the day we would come across many more of these shiny high-tech beasts. Nonchalantly parked on cobbled streets they were like a window into the future in this medieval town. 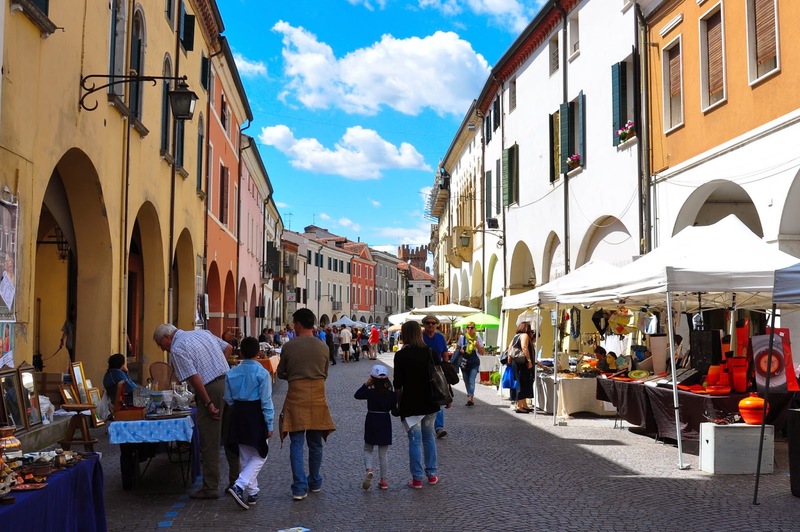 On the main street of Montagnana an antiques fair was in full swing. People were flitting from stall to stall, children clamoured for balloons and there was a festive atmosphere that took hold of us. 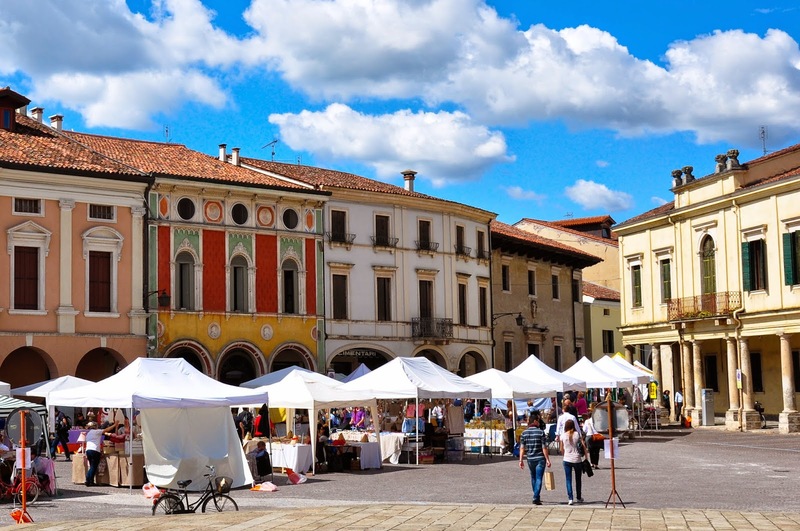 With its curved arcaded streets, colourful buildings and architectural ornamentation, Montagnana captured my imagination and I started making plans for us to return there many more times. 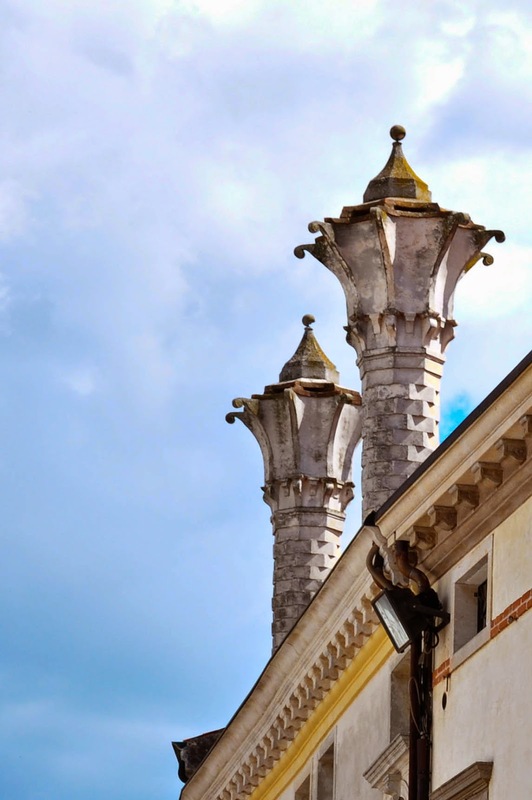 I was particularly taken with this pair of chimneys on a house just off the main square. I saw in them something of the folly of Gaudi’s approach to architecture. Before I could go off on a tangent, my husband reminded me why we were there in the first place. The Prosciutto festival beckoned! On the main square a huge marquee had been set up. 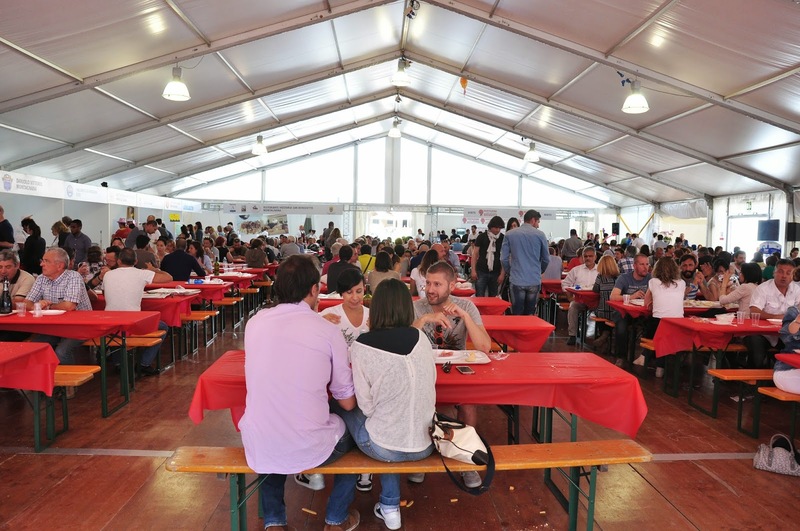 It was full with benches and tables and lined up with the stalls of several prosciutto makers. It was noisy and brimming with people. 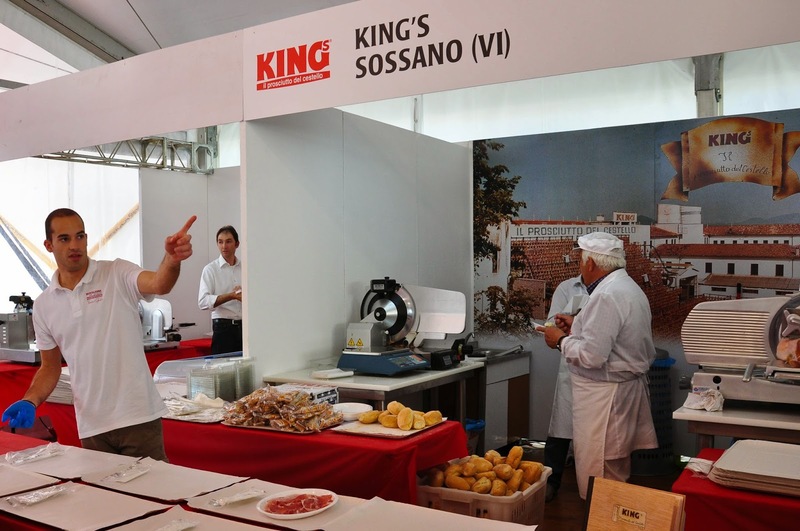 It worked like this – you bought a ticket from the cash-desk and then took it to the booth of your favourite prosciutto maker to exchange it for a plate of freshly sliced prosciutto. Unsure which maker to choose, at the end we handed one of our tickets at the booth with the largest queue in front of it – Daniolo Vittorio from Montagnana. Then picked another plate from the booth of Prosciuttificio Boselli from the municipality of Roveredo di Gua, which we chose at random. Both were a thing of beauty! 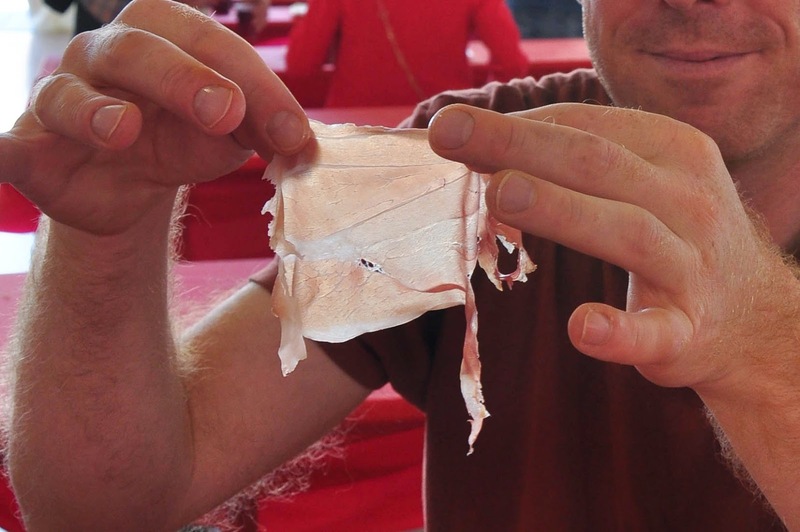 After a lot of munching, chewing and deliberation, the prosciutto of Boselli was announced our personal winner for its melt-on-the-tongue texture and less salty nature than its competitor. Outside the sun was in full blaze. Right by the prosciutto marquee a photo-shoot was going on. 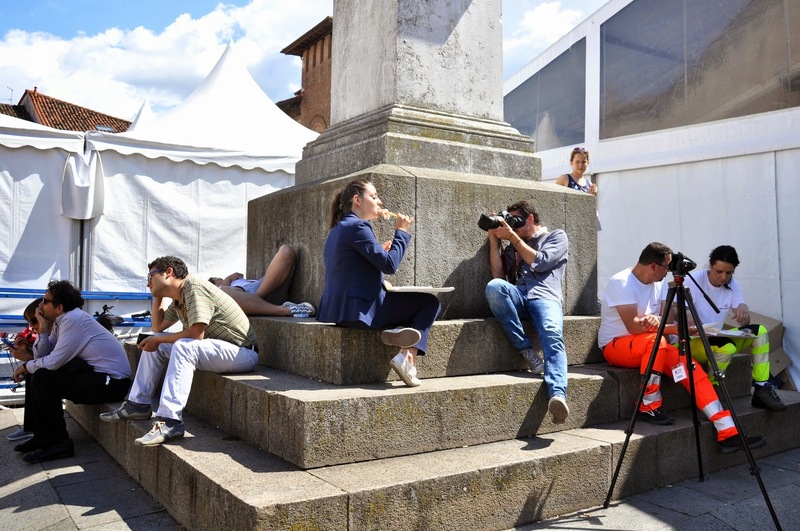 The photographer was snapping away a beautiful young girl eating a prosciutto slice. She would wrap it round a tick breadstick and pose, then do it again under the photographer’s instructions. The girl looked just like the one on the poster for this year’s Prosciutto Festival (see the fourth picture from top to bottom). Perhaps they were shooting for its next year’s edition. We have certainly already put it in our diaries. It was time for us to make a move. At 5 pm we were booked for a visit to the facilities of a local prosciutto maker and couldn’t quite wait to see how the magic was made. Check the blog during the week for my story about the visit coupled with many photos like this one. Enjoy!